Experience has taught us through the years that there is not set speed for diamond drilling. Drill speed depends on the material, the operator, the pressure and other variables. Today, we recommend a variable speed control on your machine. The operator will soon determine the best speed for the specific job he is doing. A further point to be dealt with is the recommended speeds for drilling. We hesitate to generalize since so many variables are involved. Speed may range from 2000 to 8000 ft/min. Depending upon the drill type, operator, and operation. It is important and indeed essential for the user to observe closely the tool at work, if he/she is to obtain an improvement in the tools work capacity by skillfully altering speeds and coolant as the tool is adjusted. Truing a tool is the operation of squaring a tool so that it runs within required tolerances. This is done with a hard stone that will knock the high diamonds out of the metal matrix, or by using a Brake Dresser with a Silicon Carbide wheel. 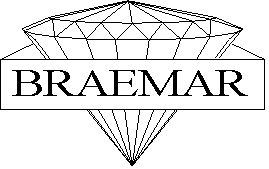 Braemar will ship drills ready to use and a small break-in period may be needed. Diamond Core Drills that are correctly dressed are directional and should always turn in the same direction with the leading edge of the diamond cutting into the workpiece. Using the correct dressing sticks will expose the diamonds for optimum cutting performance. After each dress give your drill the “Thumb Nail Test” by snagging your thumb nail on the diamonds. This will give you an indication of how free cutting your drill is and will be a good reference point on how often this process should be repeated. After using your Diamond Core Drill it may seem to drill slower or may begin to chip your material, diamonds may not be exposed. Do not force the tool, stop and dress the drill. This is an important subject. Core hang-up generally takes place just at the point of break-through. As the core breaks away from the workpiece, especially when the workpiece is not properly supported, there is usually a rim of unground or unabraded material at the very bottom of the core. Being unground, it is wider than the core drills 1.0. This unground rim causes the core to stay firmly within the drill. By waxing down the workpiece with a minimum of wax adhesive and by properly supporting the workpiece under the drilling point, it is possible to drill completely through the workpiece, have the core remain in position and also obtain clean holes. Remember, good coolant pressure, a suitable coolant type, and a minimum of Pressure, at break-through will help to prevent core hang-up problems. Whenever possible, a dial gauge should be used so that the operator knows exactly the point of break-through, and so can reduce the downward pressure of the quill and ease the drill through its last few thousandths of an inch of travel. Braemar manufactures drills to a plus or minus 0.001” tolerance on drills that are 3.000” or smaller. Tighter tolerances can be obtained on request. It is nonetheless often found that while the drill measures on size, the resultant holes may be oversize. This is brought about either by bad drill alignment, machine run-out or a badly ground drill. First, check the machine spindle head to be sure there is not run-out. Check that the drive belt is not too tight or too slack since either condition affects spindle motion. Also be certain there is no foreign matter on the drill seat, to cause misalignment of the drill. Check the drill for head concentricity. If the head is not absolutely concentric with the tail or mounting portion of the drill, it will produce oversized holes. The fact that the head size mikes correctly means little. A single high diamond will also produce oversize holes, but may not be detected when the drill is measured. So it is prudent to check the drill head with a loupe. If a high diamond is found, switch on the machine and lightly touch the drill head with a fine file, to chip off the high diamond without damage to the drill surface You have, no doubt, often heard it said, just drill into a scrap piece of glass and your drill will align itself. This is correct to some extent. The drill appears to be running true. But to be certain place a dial indicator against the head of the Drill and rotate the spindle by hand to be sure there is no run-out. Be sure the dial indicator is fitted with a nylon-protected finger. Tapered drills have also been successful. Here, the drill portion of the head is below required finish size, while the section immediately behind or above the head tapers out to the correct finish size. This results in a hole reamed to finished size while at the same time removing any chipping. With this type of drill a catchment is required beneath the workpiece to trap and return the coolant to the outside of the drill during the remaining action. Finally, a disintegrating core drill with the drills ID. Offset to one side (of the drill) also helps to prevent core hang-up. With this type of design, the actual core material is smaller than the drills internal diameter, and can easily be washed away by coolant pressure. Be sure to tell us what you will be drilling. We can then deliver the correct diamond size and matrix. Also ask for the drill to be made to your largest tolerance - i.e., if ordering, say, a 1 inch drill with a given tolerance of +/­.001 inch, request that the drill be made 1 inch + .001 inch and - .000 inch. This will give you longer drill life. Dual core drills can increase production by drilling the ID and OD at a single pass. There is a learning curve when using these drills, we have had many successful applications with this style of drill. Typically we can hold both dimensions by ± 0.001” on drills that are 2.000” or smaller. Concentration is a measure of the amount of diamond used in the drill. A 100% concentration drill would contain 25 volume percent diamond or approximately .72 cts. Per cubic inch. The majority of drills (90-95%) contain 100% concentration. Finer grit sizes and other drilling variables might lower this concentration The true measure of a drills performance is not the amount of diamond, but rather is a complete performance evaluation. Today, virtually all drills are made with synthetic diamonds. There are special types that have been engineered for this purpose. For plated drills many manufacturers use GE synthetic diamonds of the MBS (t) type in 120/140 grit or De Beers ECD type synthetics. For impregnated type drills De Beers SDA or GE MBS is used.